Central Apartments Barcelona is 100 metres from Verdaguer Metro Station and 10 minutes’ walk from Passeig de Gràcia Avenue and Sagrada Familia. Set in a Modernist building, the air-conditioned apartments feature free WiFi, and some have balconies. Each modern apartment has a living room with a sofa and flat-screen TV. The private bathroom comes with a hairdryer and shower. There is a well-equipped kitchen with a dishwasher and washing machine, as well as a fridge, microwave and coffee maker. 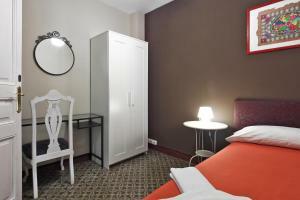 Bed linen and towels are included in all apartments. 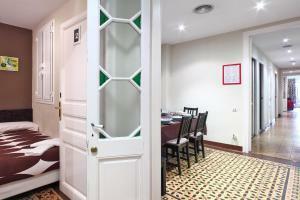 The apartment building has a lift and tourist information is available. You can reach the Ramblas in 10 minutes by Metro, and Barceloneta Beach in 20 minutes. Please note that late check-in after 20:00 has a surcharge, that must be paid in cash on arrival: -€ 20 for late check-in from 20:00 to 21:59. -€ 40 for late check-in from 22:00 to 23:59. -€ 60 for late check-in after 00:00. For late arrivals, there is also the possibility to do an "automatic check-in". The property sends you the instructions on how to use codes for the main door and for the minibox containing the apartment's keys. In this case, there would be no extra fee. This option is upon request. Please note that the lift stops midway between each floor, leaving just a few steps to get to your apartment on each floor. Please note that parties are not allowed within the property. Quiet hours are from 21:00 to 09:00. This elegant apartment has a street-facing balcony, high ceilings and mosaic floors. There is air conditioning, free WiFi and a living room with a sofa and flat-screen TV. The private bathroom comes with a hairdryer and shower. There is a well-equipped kitchen with a dishwasher and washing machine, as well as a fridge, microwave and coffee maker. A free safe is available. This apartment accommodates 2 adults + 2 children under 18 years old. Please note that the second bedroom has single beds measuring 180 cm in length. Rate: € 104.67 ... € 230.00; select dates below to get current rates. 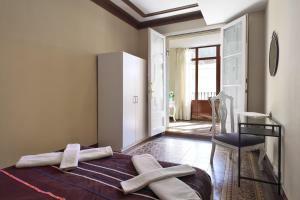 This elegant room has an interior-facing window, free WiFi, high ceilings and mosaic floor. 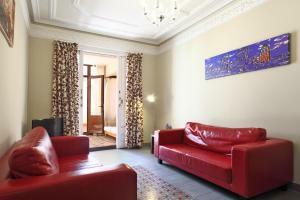 It features a large gallery and a living room with a sofa and flat-screen TV. The private bathroom comes with a hairdryer and shower. Another en suite bathroom is available, connecting to the main double room. There is a well-equipped kitchen with a dishwasher and washer dryer, as well as a fridge, microwave and coffee maker. A free safe is available. This elegant apartment with high ceilings and mosaic floor features a terrace.There is free WiFi and a living room with a sofa and flat-screen TV. There are 2 private bathrooms with a hairdryer and shower. The well-equipped kitchen comes with a dishwasher and washing machine, as well as a fridge, microwave and coffee maker. The apartment includes a free safety deposit box. 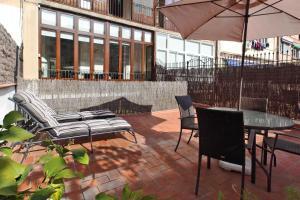 This elegant apartment with high ceilings and mosaic floor features a terrace. 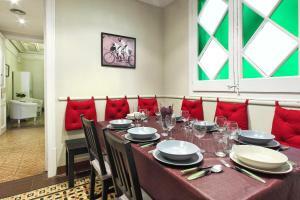 This air-conditioned apartment has free WiFi and a living room with a sofa and flat-screen TV. It has 2 bathrooms, one with shower and the other with bath. 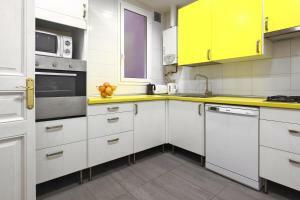 There is a well-equipped kitchen with dishwasher and washing machine, as well as a fridge, microwave and coffee maker. The apartment includes a free safety deposit box. 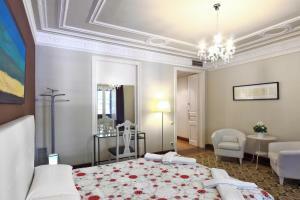 This elegant room has an interior-facing window, free WiFi, high ceilings and mosaic floor. The living room features a flat-screen TV. A free safe is available. There is 1 double bedroom connected to 1 single bedroom and 2 separate single bedrooms. The bathroom has a bath and a hairdryer.